Matthias Suuck looks at the stories behind some of German’s biggest local derbies…big derbies that are taking place this weekend. 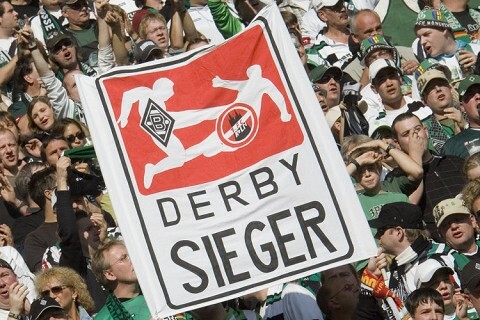 This weekend is derby weekend in the Bundesliga and nothing evokes supporters’ passions more than a derby match. These are the matches where (for the supporters) league position is secondary and bragging rights against their bitter rivals is all that matters. There are plenty of great rivalries in the football world and Germany is no different. There are scores of great rivalries across German football, from the lowest leagues on up to the top of the Bundesliga. The region richest with rivalries is undoubtedly the west of the country, more specifically Nordrhein-Westfalen, since it is one of the most densely populated regions of the country, both in terms of inhabitants and football clubs. It is also the cradle for what is widely recognized as the greatest of all German football rivalries, the “Revierderby”; Borussia Dortmund vs. FC Schalke 04 and it will once again be on display this weekend. THE derby of the west features two of the most passionate (and similar) fan bases in Germany. In fact, the similarities between the two clubs cannot be denied. Both come from the working-class areas of Gelsenkirchen and Dortmund, where historically most supporters (and even some players) came from the mining industry of the region. These clubs’ supporters are not separated by their religion or their income, but rather simply by the fact that they grew up a mere 35 km apart. Ever since the founding of both clubs over 100 years ago, they drew much of their support, as well as players, from eastern European immigrants. Simply looking at some of the great players’ last names from the past highlights this fact, e.g. Ernst Kuzorra, Fritz Szepan, and Heinrich Kwiatkowski. I believe, in fact that the bitterness of this rivalry does not lie in the differences between the clubs and their supporters (as is the case in the Old Firm derby), but rather in the similarities. They are almost like estranged brothers and nobody likes losing to their brother. What many outsiders do not realize is that the rivalry did not even exist prior to World War II. Schalke, with its magical “Schalker Kreisel” dominated football in Germany during the 1920’s and 30’s, when it won four German championships and one cup title. Dortmund at that time was more of a lower league or also-ran club. However, after the formation of the Oberliga system in 1947 the rivalry truly began to take shape, especially with a new batch of immigrants to work the local mines, coming from the recently lost eastern reaches of Germany. In the 1950’s the rivalry came to a head when Dortmund, lead by manager Helmut Schneider won two German titles (1956, 1957) and Schalke one (its last) in 1958. Dortmund supporters have never let Schalke supporters forget the fact that the last of their seven German titles came over 50 years ago. In fact, a group of BVB supporters paid for a small plane to fly over Gelsenkirchen in 2008 with a banner reminding them of the 50 years without a league title. Though the rivalry ebbed a bit in the 1970’s and 80’s, when both teams had their spells in the second tier of German football, it came back with a roar in the 1990’s. This was a decade that saw Dortmund’s greatest success since the 50’s and both clubs winning European titles in the same year, 1997 (Dortmund the Champions League and Schalke the Uefa Cup). Though Dortmund has had more league success than Schalke in the last 20 years (4 Bundesliga titles), the “Knappen” (nickname for Schalke) have had more success in the cup (3 titles). The animosity of both sets of supporters runs deep, with neither side actually using the name of the other’s city. Schalke supporters refer to Borussia Dortmund as “Lüdenscheid-Nord” and Dortmund supporters refer to Schalke as “Herne-West,” in a way to make each side sound more provincial and less sophisticated. Ironically, Schalke (unlike Dortmund) is one part of the city of Gelsenkirchen (Gelsenkirchen-Schalke) and not its own true city. This deep seated rivalry also extends to the pitch. Nowhere was this more on display than in the recent cup tie between Dortmund and Greuther Fürth. One of the Fürth players (Gerald Asamoah) played many seasons for Schalke. Before the match he stated how much he would enjoy ending “Lüdenscheid’s” cup dreams with a winning goal late in the match. After Dortmund defeated Fürth with a dramatic last-second goal, lifelong Dortmund supporter (and former Ultra member) and star player Kevin Großkreutz (who once said that if his son became a Schalke supporter he would stick him in an orphanage) decided to rub the victory in Asamoah’s face, who took exception to it (but let’s remember who actually started it shall we). This weekend’s match has added importance for both clubs. With Dortmund hoping to extend their lead over Bayern Munich at the top of the table to claim another title and Schalke in a tight battle with Mönchengladbach for the final direct Champions League spot, neither club (nor their supporters) will give an inch and either side would relish in making life difficult for the other. The other derby on display this weekend is the “Rheinland Derby” between FC Cologne and Borussia Mönchengladbach. This rivalry only really began to take shape when Gladbach was promoted to the Bundesliga in 1965. By that point, Cologne had already won two German titles. What added to the spice of the rivalry was the fact that Gladbach’s manager was the former Cologne manager Hennes Weisweiler. Under Weisweiler, Mönchengladbach quickly eclipsed Cologne with its young squad of attacking players and rose to prominence in the 1970’s, winning 5 Bundesliga titles. When Weisweiler returned to Cologne in 1976, they quickly won the cup and in 1978 won the double. Now you had two legitimate powerhouse clubs in the same Rheinregion of Germany battling near the top of the Bundesliga for many years in the late 1970’s and early to mid 1980’s. However, both clubs fell on very hard times in the last 20 years, seeing both of them relegated to the 2nd Bundesliga a number of times. Though the tradition and cultural history behind this rivalry in no way compares to that of Dortmund vs. Schalke, it is a bitter rivalry nonetheless. The edge to this rivalry, as is often the case, is delivered mainly by the fans. In recent years and months there have been extremely ugly scenes from both sets of supporters, but mainly coming from Cologne, which included a recent incident where Cologne supporters stopped a bus full of Gladbach supporters and assaulted them. Part of this is just brain dead thuggish behavior, but some of it clearly stems from the fact that Cologne are once again fighting off relegation, while Mönchengladbach are the surprise team of the season and are fighting for a spot in the Champions League. There are plenty of other great rivalries across German football that still play out every year, such as the “Nord Derby” between Hamburg and Werder Bremen. There are also more recent derbies that have sprung up over the past decade or two, e.g. Freiburg vs. Stuttgart, Mainz vs. Kaiserslautern, Wolfsburg vs. Hannover, etc. Then there are those rivalries that only success brings with it, such as the ones between Bayern Munich and Borussia Mönchengladbach, Werder Bremen, Borussia Dortmund and Bayer Leverkusen, but these lack the bitterness of the local derbies. There have also been historically significant rivalries that have faded a bit over time, since the clubs hardly face off anymore, as is the case between Bayern Munich and 1860 Munich or Eintracht Frankfurt and Kickers Offenbach. As you can see, the rich history of football in Germany has delivered some outstanding rivalry matchups over the past 100 years, and this weekend’s fixtures of Dortmund vs. Schalke and Mönchengladbach vs. Cologne are sure to be no different. Posted on April 12, 2012 by Jon. This entry was posted in 1. FC Köln, Borussia Dortmund, Borussia Mönchengladbach, Bundesliga, Schalke. Bookmark the permalink.